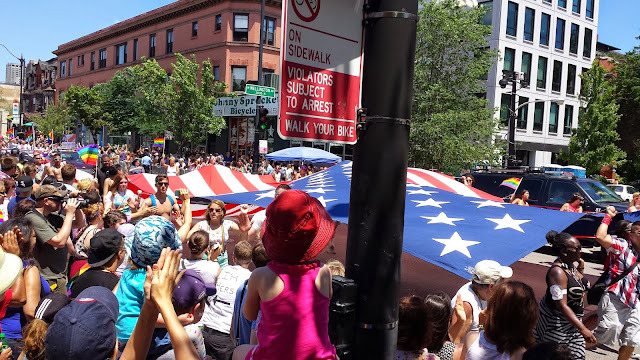 Pieces of information are beginning to emerge about how the city and Chicago Pride Parade organizers plan to rectify the increasing challenges that the event has faced in recent years. And a formal announcement on the details may come within a week. But we have one idea we’d like to propose (and we can hardly believe that we’re suggesting it). We want to organized a Pride Sunday community walk. Kind of a post-Pride Parade parade. More on that in a sec. At a recent community meeting, Erin Duffy of Ald. Tom Tunney’s office announced that a “parade committee” has been formed, although how its members were selected and who its members are remains a bit of a mystery. Duffy said that this year’s parade will kick off at noon, as the parade always has, putting the kibosh on talk that it may start earlier in an effort to reduce drunkenness. Duffy also announced that this year’s parade will be led by all of the participating politicians walking in one group rather than as individual entries. This would seem to be an effort to reduce the length of the parade. We’d much prefer that the politicians be placed at the end of the parade. After all, the parade isn't about them. But, hey, when politicians are making the decisions, politicians get to march wherever they want. According to Duffy, the clandestine committee is focusing on the parade’s effects on the neighborhood for a full 24-hour window. As recently as last October, the official site listed the actual route, which was established in 2012. That may mean nothing or it may mean that a route change is coming. We favor having the parade bypass Halsted altogether—going straight down Broadway to Diversey. That would eliminate the dangerous overcrowding that forms as spectators naturally try to get as close to Roscoe and Halsted as possible. This will probably never happened, but we favor it. Anywho, on to that idea of ours. We would like to invite Alderman Tunney, Alderman James Cappleman, business representatives, neighbors, our new police commander, and parade organizer Richard Pfeiffer to join us for a walk of the neighborhood at 1AM on the Monday morning after Pride. That's about 10 hours after the parade is supposed to be over. We’ll walk the streets from Roscoe and Halsted down to Belmont then over to Sheffield. We'll hang out there, taking in the local flora and fauna, and then walk back east on Belmont and north on Halsted to Addison. The goal? To remind the remaining, uh, revelers to respect the neighborhood and not ruin the fun for everyone. Maybe we could hand out little pieces of paper with Pride Fest’s 2015 slogan, “Keep Pride Proud" and a request to disperse in the interest of the parade's future. Now, we know. At this poiint, faithful CWB readers are probably thinking that someone has hacked our site. After all, we hate positive loitering and “take back the neighborhood” marches. We think they are nothing more than theater for cameras and feel-good events that make it look like something is being done. But this would be different. This would be a chance to for everyone to see exactly what is going on and to make an effort to clear the streets. It’s a chance to confront at least one of the many issues that face Pride this year.